Every one-of-a-kind baby deserves gentle cleaning, which is why Pampers Sensitive Baby Wipes care for your baby's sensitive skin in the kindest possible way. 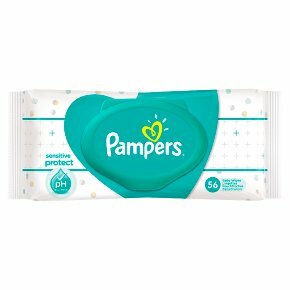 They come with Pampers unique Soft Grip Texture and they are 15% thicker than Pampers Fresh Clean wipes. Their balanced wetness leaves the skin feeling cleaner while helping to maintain the natural pH Don't fear the mess again, with Pampers Sensitive Baby Wipes. Pampers sensitive protect baby wipes help prevent skin irritation. pH balanced. Dermatologically tested. 0% phenoxyethanol, paraben, perfume & alcohol. Proven to be as mild as cotton wool and water. Approved by the British Skin Foundation. Pampers sensitive protect baby wipes are specifically designed with your baby?s skin needs in mind. They help prevent skin irritation and to maintain the natural pH level of the skin. They are dermatologically tested and are free of phenoxyethanol, parabens, perfume & alcohol to provide gentle care for your baby?s skin. Please dispose of wipes in the bin - do not flush wipes.